Next up in our continued Black Bear Airsoft review project is the V5 Reaper Mesh mask review. This mask is an interesting design, similar to a mesh hockey mask with a slot for your eyes. It is designed to be used with a pair of goggles providing the eye protection. The mask has a very unique and aggressive look, as well as full face protection from BB strikes. I'll cover the pros and cons of this mask system in this review! Like the rest of BBA's lineup, I received this directly through their distributor ACMGear.com. For the purpose of testing and evaluation, we were sent several masks in black, woodland, tan, and Punisher skull painted. It is available HERE, priced between $25.99 and $32.99. It is available in Black, Tan, Brown, Grey, OD, Woodland, and the Punisher painted design. 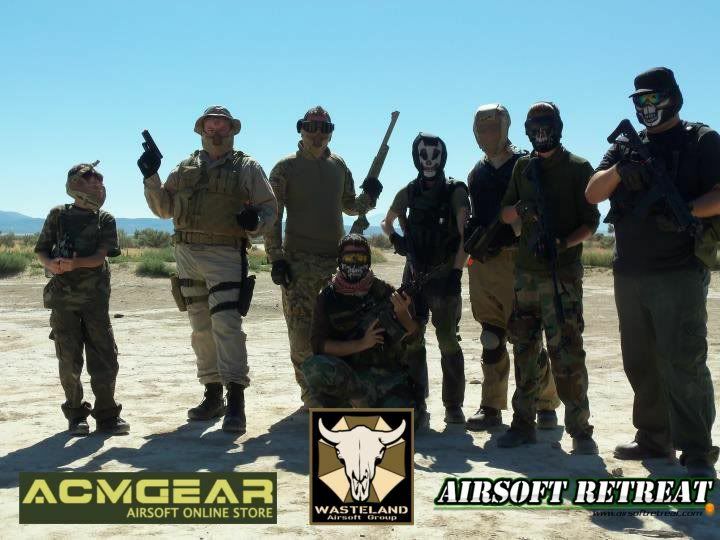 Black Bear Airsoft has recently chosen Airsoft Megastore to be their exclusive US distributor, so in the next few weeks you'll be able to buy these from a US based retailer! As mentioned before, this is a full face mesh mask that provides protection from your forehead to your chin. It has a rectangular slot where your eyes are for you to cover up with your choice of goggles. The benefit of having an open slot over your eyes as opposed to mesh like some of their other masks is to give you unimpeded vision, while still giving you plenty of protection when used with goggles. It is available in a wide range of colors and patterns to be used with pretty much any loadout. My first impression on seeing these masks was really how intimidating they look. It's seriously an aggressive looking piece of equipment, especially the Punisher painted model. The things could easily double as props for a bank heist movie. The Reaper mask is made using Black Bear Airsoft's high strength powdercoated steel mesh with fabric surrounding all of the edges to prevent discomfort. It uses a wraparound attachment system that goes over the top of your head, connecting to the cheek pieces by adjustable elastic straps. It is very secure when you've got it adjusted to fit your face. The mesh fits your face well and can be bent to fit better if you need some adjustments. That's the real benefit of the mesh that BBA uses is that it can be bent to fit your face while still remaining strong enough to take a hit. On the sides, it extends back enough to cover your temples, and the straps are low enough to cover the bottoms of my ears. The cheek pieces extend down a little bit further than their other masks, which could hinder your ability to use some iron sights, but you shouldn't have any problems using most high rise optics. The mask is still fairly low profile, and it has an ergonomically designed lower portion, bent to fit your nose, cheeks, and mouth. It is a little bit narrow in the cheek section from the factory, so you may want to bend it out a little bit to fit your face before use. The nose section is also a little bit cramped for me, but I have a big nose, so this is a frequent problem for me, lol. Visibility is unhindered due to the rectangular cutout over your eyes. When used with full seal goggles, you'll have a clear view combined with full facial protection. The rectangular slot is too narrow to fit glasses in, so if you wear glasses for vision correction you may have some issues. The ergonomic design of the mask means that most goggles will fit perfectly against the mesh. The mask is held tight against your face using a wraparound strap system that is attached to elastic straps at the cheeks and a velcro attached portion at the top of the mask. This makes it very secure as well as adjustable to fit various users. There is loop side velcro at the top and rear of the mask for attaching various patches, name tags, etc. The attachment pieces are all riveted to the mesh material for rock solid construction. Overall, the BBA V5 Reaper mask a fairly comfortable mask to wear, once you get it bent to fit your face. The mounting system is very secure but still comfortable to wear for extended durations. The overall look of the mask is really intimidating, especially on the painted models. If nothing else, it's a very cool looking mask to separate you from other players on the field while still offering plenty of protection.